Students enjoy showing their appreciation to those who give back to RIT at last yearâ€™s Thank A Giver Day. It’s that time of the year when tags paint the campus for RIT’s annual Thank a Giver (TAG) Day, a day dedicated to celebrating those who have given back their time, talent and treasure to the university. 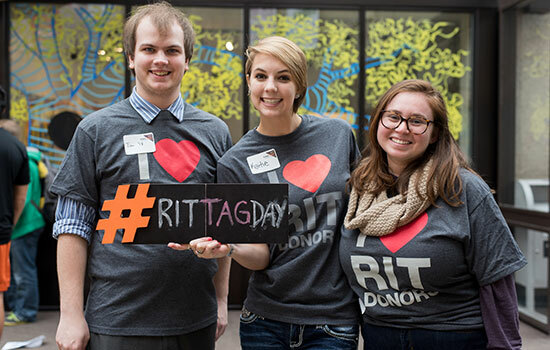 To celebrate RIT’s donors, The Fund for RIT is hosting a TAG Day Fair from 11 a.m. to 2 p.m. on Tuesday, Feb. 13, at the Campus Center. At the fair, people will be able to learn about giving back, write thank-you cards for donors and participate in giveaways and other fun activities. There will also be opportunities to give to the university both online and in person. One way that Frey and The Fund for RIT are able to visibly show the impact of donors is by hanging tags on buildings, in labs and classrooms and other areas that are supported by donor generosity. “We are a relatively young university and we are still really building that culture of philanthropy and giving back. 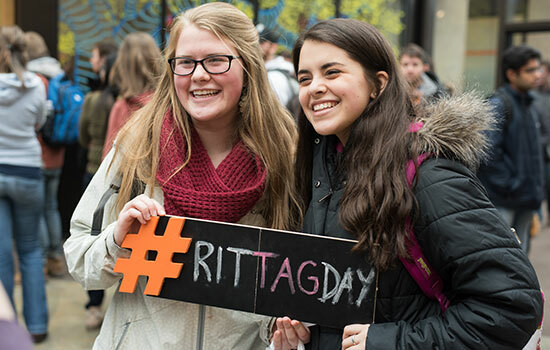 Something like TAG Day can encourage alumni, parents, faculty, staff and friends to think about how they can give back to RIT so we can continue to grow as a philanthropic community,” said Frey. In the 2017 fiscal year, more than 14,000 donors made contributions to the university. These contributions provide support for classrooms, labs, organizations and clubs, scholarship recipients, endowed chairs or other areas on campus that may need support. Fifth-year industrial engineering and sustainable engineering student Taylor Blackwell has seen what donor support can make possible firsthand. An easy way to participate in the TAG Day celebrations is by positing on social media with #RITTAGDAY or by submitting a thank you to show appreciation for the impact donors have on the university. People can use #RITTAGDAY to thank people who have given back to the university. Students last year used conversation hearts to show their appreciation for gifts to the university.